The only way you're going to enjoy this movie is to just go along with it... because depending on how far you're willing to let the directors wander from reality will determine whether or not you switch off before the credits roll, or whether you feel the ending is satisfying or confusing. I personally had strong feelings at the end of the movie, and it had me thinking for a couple of days afterwards (which is always a good sign to my mind). Yes, the directors and actors had managed to get under my skin, I cared for the uniquely flawed characters and craved clarification that how I viewed the ending of the movie was what the writers had intended. Was Hank mad? Was any of it real? Was all of it real? But at the end of the day it doesn't matter. You take away from it what you want. This is a movie that works or fails on the back of the performances of the actors. Paul Dano and Daniel Radcliffe really do work well on screen together. Even those he's onscreen for so much time, Radcliffe does so little in this movie, so it's incredibly satisfying that we form an attachment to his child-like Manny. Extras include Deleted Scenes (8 min, 48 sec); Behind the Scenes (16 min, 01 sec); Making of Manny (3 min, 06 sec look at the various dummy versions of Manny and how some of the effects were achieved); Q&A with Filmmakers (1 hr, 04 min, 01 sec); and an audio commentary which is particularly interesting. It doesn't really give you their interpretation of the film's ending. 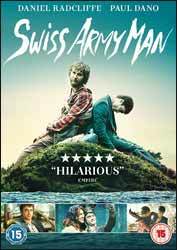 but they jokingly state the film leaves it open for a sequel which they're going to call Swiss Army Man 2: Manny in Japanny). While I did enjoy the film, it's not one I'd be too bothered about watching again in a hurry.